Image Size: 25 1/4"w x 16 1/2"h.
The Apollo program was not only about getting to the moon and back, but making the best possible scientific observations once there. "Do we take test pilots and teach them geology or do we take geologists and teach them to fly?" was the question. The answer, in typical NASA fashion, was to create a team of both. This image of Apollo 17 Commander and skilled naval aviator Eugene A. Cernan handing yet another sample bag to Lunar Module Pilot and Doctor of Geology Harrison "Jack" Schmitt on the Taurus-Littrow Valley floor, represents the epitome of this exploration philosophy. 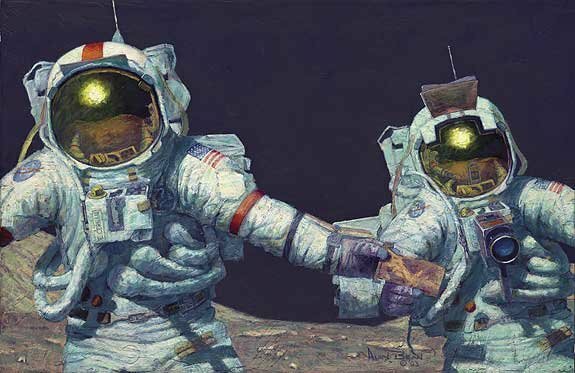 On December 13, 1972, when Gene and Jack left the moon, they carried with them 240 pounds of lunar samples-more than any other mission could boast.